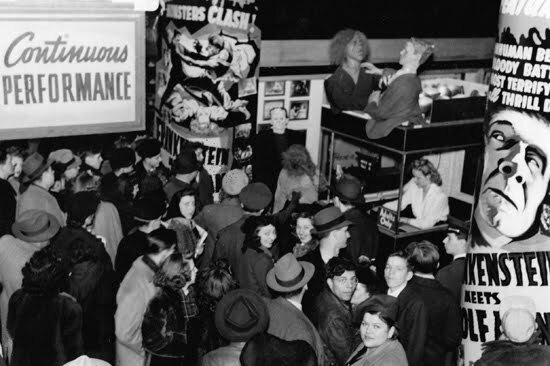 A crowd gathers on a chilly March evening in 1943, drawn to a garishly decorated cinema lobby. Frankenstein Meets the Wolf Man has come to town and the exhibitor blows the works: Floor to ceiling posters shout Mighty Monsters Clash!... Hair Raising Horror Hits New Heights!... Inhuman Beasts! 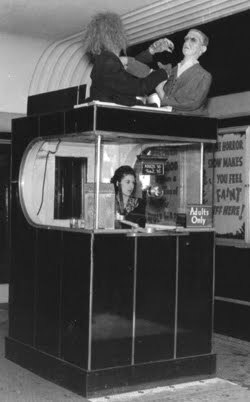 Performers in costume entertain the throngs lining up for tickets and, look, up there on the box office booth, The Monster and the Wolf Man are at each other’s throats! Miraculously, almost 70 years on, the mannequin monsters have survived and are shared here with us, thanks to collector Bobby Beeman. These unusual plaster heads, a bit battered but complete, are an unexpected and extraordinary find, and a wonderful example of classic movie ballyhoo. There appears to have been more than one set of these built. The Frankenstein Monster in the old photos has a classic flattop and forehead bangs while the surviving plaster head is rounded out and made up like Karloff in Bride of Frankenstein, with exposed forehead clamps and a distinctive burn scar on the cheek. The Monster’s head shows signs of long-ago repair and may have been modified along the way. The Wolf Man head has fared better, still sporting its scraggly hair and eerie glowing eyes, the bulbs, sockets and cord embedded in plaster and, amazingly, still operational. Based on a few tantalizing clues and some digging around, it appears that the heads were constructed by the J.H.Blecher Studio of Detroit. Through the first half of the 20th century, the Greektown company produced full-body mannequins for department and clothing stores, and display heads for hat, wig and cosmetic suppliers. It may have also produced affordable plaster statuary for churches. In 1963, Mario Messana, a long-time apprentice of Harry Blecher, bought out the business. Now called Mario’s Mannequin Studio, the company concentrated solely on repair work for a dwindling market, the classic plaster and fibreglass figures being progressively replaced by mass-produced plastic mannequins. Until his own retirement, in 1995, Messana stored away a number of classic torsos, assorted limbs and exceptional heads, including delicate, early wax creations by the famous Dutch studio of Pierre Imans. This is where the Frankenstein and Wolf Man heads, no doubt saved for their novelty value, were first discovered back in the Eighties. 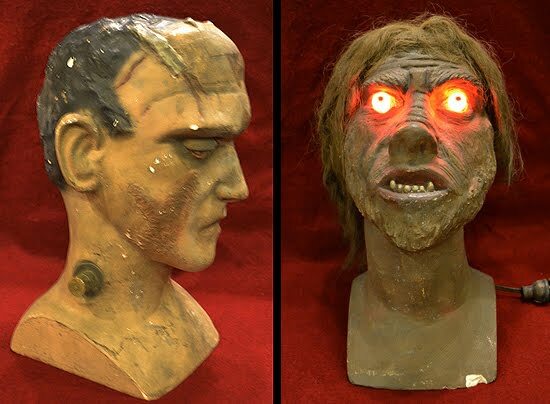 It is possible, of course, that the heads were manufactured by another company, landing at Blecher’s or Mario’s unclaimed or brought in for repairs, but there seems to be a direct line of provenance here, based on the recollections of previous owners of the Frankenstein/Wolf Man display. Still, we don’t know who ordered these originally. It could have been Universal’s promotion department, a regional distributor, a theater chain or even individual exhibitors. Until new info or new photos surface, we can’t tell. The theater in the photos is still unidentified. I want to thank Bobby Beeman for so generously sharing his remarkable discovery with Frankensteinia readers. 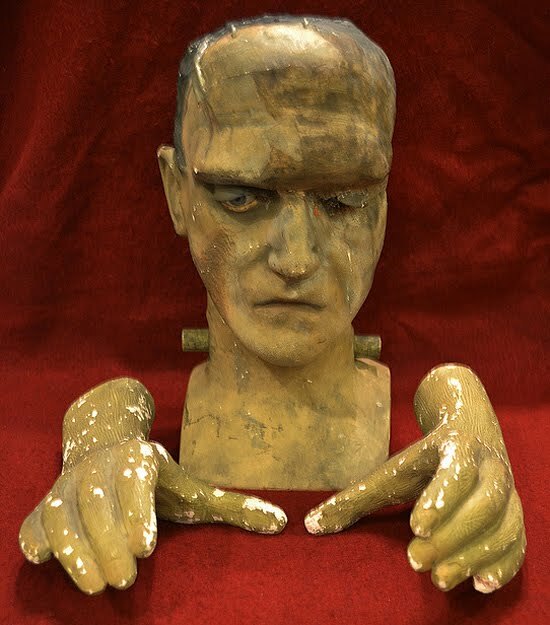 Bobby has posted more images here, at the Universal Monster Army board, an essential and enthusiastic celebration of movie monster toys and collectibles. More great photos on Universal Monster Army. An article about mannequins, with references to Blecher and Messana on Detroit’s Metro Times. "When you've got an upset stomach after eating too many villagers, more monsters recommend Monsolat." BTW, I don't think I've ever seen that Frank Meets Wolf poster on the far right of the pic. Very clearly Lugosi's monster there. Amazing relics! Thanks so much for posting this! Jeeze this blog is like a full-blown miracle. Every time I come here I go away feeling like some kind of expert. oh boy!..I wanna see that Picture! "look at them frankenstein and wolf man fans lining up. lol..is that an ADULTS ONLY sign in the ticket window?. Yes, Adults Only! Depending on State or City laws, that could mean anything from 13 to 18 years old. Previously, well into the 30s, there were no age restrictions. Ads for FRANKENSTEIN in 1931 said "Not Recommended" or "Usuitable for Children". That basically meant that kids weren't allowed in alone, but they weren't turned away if they were accompanied by an adult. Back in the 60s in my hometown of Montreal, "adult" was 16 and over. I was tall, I put on a suit and tie, and I got in to see THE BIRDS when I was 13 without being carded. And then there were the flea pits and they'd sell anyone a ticket, regardless of age. I remember going to Mario's Mannequins in 1968 to buy a mannequin to use in an art project for a class at Wayne State University. I rented an open trailer to transport the finished project to class. The trailer was hitched to my car as I went through the gate in the parking lot. The gate got ripped off as the trailer went through as the gate automatically came down after my car went through. Good times!